As a world–renowned cardiologist who has dealt with life and death on a daily basis, Dr. Terry Gordon understood that life can change in the blink of an eye. However, in June of 2009 nothing could have prepared him for the fateful phone call he received informing him that his 20 year-old son, Tyler, had been involved in a near fatal car accident, sustaining a severe spinal cord injury that left him quadriplegic. Dr. Gordon’s journey from the day he left Ohio to be at his son’s bedside and the profound response he received to his heartfelt prayers, resulted in a spiritual awakening and a clearer understanding of life and the truths it has to offer. His compelling and emotional true story of surviving the fiercest of life’s storms to finding the rainbow through the clouds is documented in his inspiring memoir. In this book, Dr. Gordon contends that rather than lamenting so-called adversities in our lives, we can choose to be grateful for them. We can embrace them and accept them as gifts from the Divine; as they can provide fertile soil for growth and enlightenment. For anyone dealing with adversity, tragedy, grief, emotional or physical pain, this book provides refreshing and inspirational insights that can help the reader appreciate how a so-called tragedy can actually be a blessing in disguise. 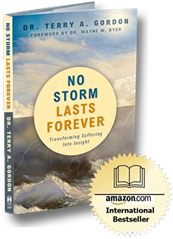 No Storm Lasts Forever offers insight into how to transform turmoil, disappointment, and suffering into understanding, insight, and resolve. No storm last forever but LOVE does. This book is an inspiration, I believe it should be present in all the spinal cord centers around USA and must be given to the families and the patients that happen to be there. The book touch my heart, I wept few times, less than I expected. I was in a state of aahh reading those lines and could not believe that Dr. Gordon existed in this world. I admire each of every one of his family members for the instrumental role they’ve done in Tyler’s recovering. Sharing wisdom and love in the midst of heartache. “No Storm Lasts Forever is a beautiful love story from a father to his son, a husband to his wife, and a man to his family and community. Many of life’s simplest lessons and insights are woven through the story of his son, Tyler and the heartbreaking injury he suffered in a car accident. The subsequent struggle for Terry, Tyler, and their family to find peace and happiness in the midst of an overwhelming challenge is heart achingly beautiful. Terry chooses not to wait for the storm to end before looking for sunlight. Clearly Tyler’s accident forever changes each member of the family, but the foundation that Terry and his wife, Angela have built remains standing. It’s impossible to read this book with out seeing that the goodness and love were in place for many years. When put to the ultimate test, Terry has used the values and teachings of his past to live in his present and find hope for the future. What an inspiring book, I highly recommend it! Having gone through several family tragedies in the last two years, I was given a new perspective on how to deal with my losses. I particularly like what the book review says, “Rather than lamenting the so-called adversities, we can choose to be grateful for them, embracing them as gifts from the Divine.” This book is beautiful and I highly recommend it to anyone who has suffered through any kind of adversity. Awesome, Dr. Terry, just awesome!! This book gives us all hope. Keeps me on a positive track when the going gets tough! Thankful for the small things.